Biggles Big Band Amsterdam is a 25-piece jazz orchestra from The Netherlands conducted by Mr Adrie Braat (musician of the renowned Dutch Swing College Band since 1988) that plays music from the great swing era, recreating the magical sounds of Glenn Miller, Tommy Dorsey, Count Basie, Duke Ellington and jazz singers like Frank Sinatra and Dean Martin. The orchestra consists of 4 trumpets, 4 trombones, 5 saxophones, guitar, piano, acoustic bass, drums and vocalist André Rabini. An extra string quartet consisting of 2 violins, viola and cello adds a sensational musical experience to Biggles Big Band. 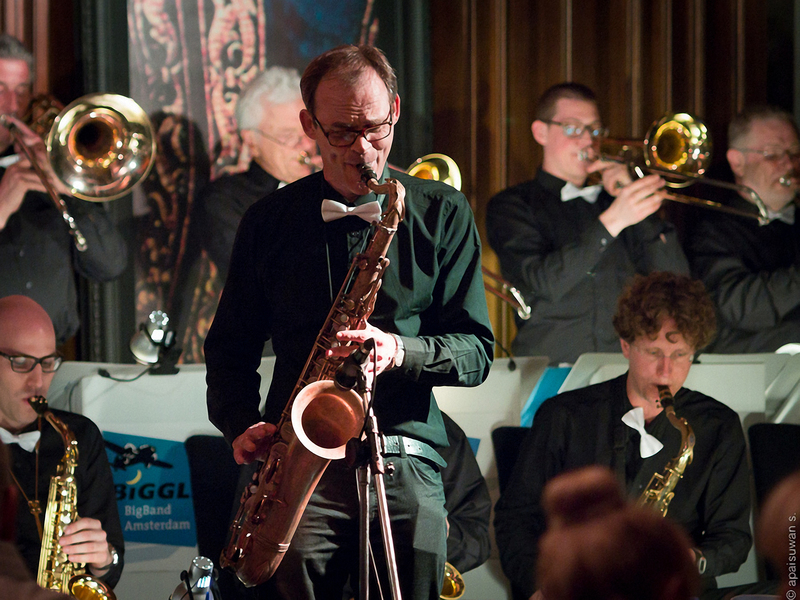 Between 2009 and 2016, Biggles Big Band Amsterdam gave performances all over Thailand. The orchestra had projects like Jazz de Chang and Jazz for Kids in Kanchanaburi, gave workshops for children in Nakhon Phanom, Dansai-Loei, Tak and Chiang Rai, had Thai guest singers and Thai instrumentalists at their concerts and played new arrangements of the jazz compositions of His Royal Highness King Bhumibol Adulyadej. Due to the great success of their 5 previous tours, the jazz orchestra from Holland has been invited back again for another Thailand Tour in March 2017. Conductor Mr Adrie Braat founded the orchestra in 1985. From the day of its foundation until today, Biggles Big Band is a smash-hit. The band is based in Amsterdam and performs every Monday night at the famous café Casablanca, located right in the heart of Amsterdam. Nowadays, there are only few big bands playing jazz music from the swing era, therefore there is a big demand from all over the world to listen and dance to this kind of jazz music. Thanks to the high standard of musicianship and spontaneity of Biggles Big Band’s musicians, their energy floats off the stage to mix with the audience. Wherever Biggles performs they get a tremendous response from the audience, not a single concert is without clapping, dancing or stamping feet! Do you have a booking enquiry or are you interested in more information?